The scratchings of Tel: Another magazine cover ! 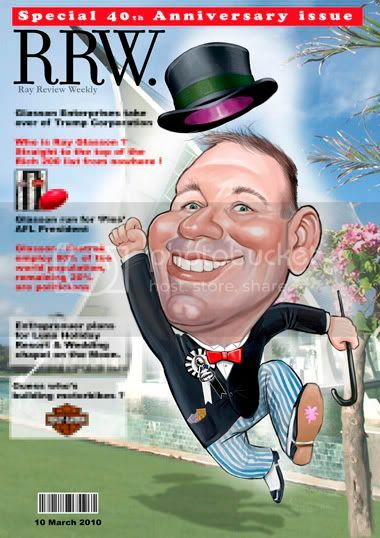 This is another bogus magazine cover based on a major Australian financial magazine and featuring the subject , a local businessman for his 40th Birthday, depicted as Mr Money Bags from the Monopoly board game. Youe onto a winner here Terry, great work mate ! Thanks Tony and Anthony - yep I think it's got some mileage in it !! Great one Tel, like the movement !!! Thanks Patrick - appreciate that ! Muitos agradecimentos para sua visita Fernandes meu amigo!